At 4:00PM on Thursday, August 2, 2007 in the Taliban-controlled village of Qaleh (Qal'eh) Chah in the district of Baghran in Helmand Province, US/NATO forces bombed the village as part of an alleged decapitation strike (targeting "two Taliban commanders"). A group of people had gathered near the popular shrine of Ibrahim Shah Baba (though the reason for the gathering remains unclear). Some victims of a US "precision" bombing strike by a B1-B dropping JDAM GBU-31 2,000-lb bombs (made by Boeing) upon a gathering near the Ibrahim Shah Baba shrine, on Aug.2,2007. 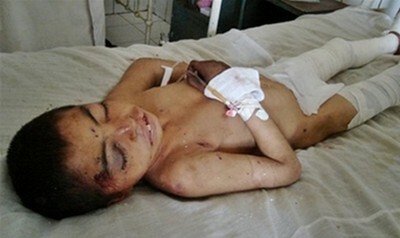 At least 20 civilians (including an 8-yr-old boy) with shrapnel wounds were brought to the main Bost hospital in Lashkar Gah, the provincial capital. One of the injured men died there. Helmand's police chief, Mohammad Hussein Andiwal said. "I can confirm there were heavy bombardments," Andiwal told Reuters by phone. "We have heard of heavy casualties too and have sent a team to investigate this." A provincial lawmaker in Kabul, Mohammad Anwar, also received reports of high civilian casualties. In the Lashkar Gah hospital, Shokhi Khan, a relative of one of the wounded, said several hundred civilians were killed or wounded in the strikes. He said people had gathered for picnics and to go to a shrine in Baghran district north of Lashkar Gah on Thursday when the raids started. Twelve wounded men were brought to a hospital in the main southern city of Kandahar, said Sharifullah Khan, a doctor there. Nasibullah, one of the wounded men in Kandahar hospital, said the bombs hit a market. He claimed there were no Taliban there at the time of the attack. Other injured persons were brought to hospitals in Sangin and Musa Qala districts. 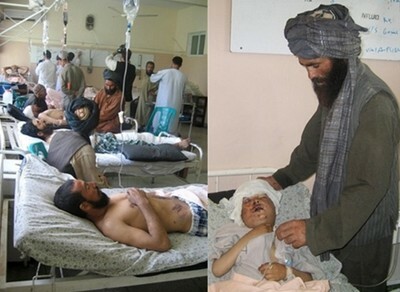 Afghan Defense Ministry said some 40 men had also been brought to hospital in the main southern city of Kandahar. "It is interesting there were no females," said British Lieutenant-Colonel Charlie Mayo, suggesting the wounded adult males may have been Taliban fighters. "We are very confident we hit a large meeting of Taliban and they are very sore about it." General Zahir Azimy of the Afghan Defense Ministry put forth the highly self-serving and U.S-pleasing lie that a large gathering of Taliban had been bombed, killing over 100 Taliban and three senior commanders. No evidence whatsoever offered. Photos of injured children being treated at both the Lashkar Gah and Kandahar hospitals confirm that the Karzai clique’s general is, as usual, dishing-out crude propaganda-speak. Moreover, the village is in a Taliban-controlled area where no doubt Sharia prevails and women do not attend public gatherings (hence no female victims)….Lt-Col. Charlie Mayo? Reporters haven’t been permitted to talk to the injured and they are under heavy guard as part of news management in order to prevent them making the truth of this slaughter known. 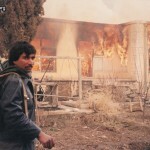 U.S. and NATO bombs rained down before upon civilians in Baghran in February 2003 (see my "A Rain of Bombs) and in June 2006 (see In memory of Gul Ahmad’s mother and father). The attention by the mainstream corporate media to 21 captured South Koreans as compared to the Afghan civilians slaughtered at Qaleh Chah is revealing. Luckily photos of the injured civilian bombing victims have been taken.